It’s been a while since we looked at all the cool new stuff from Munchkin, so let’s kick down the door and see what new treasure there is for us. First up, at PAX Prime this past weekend, Steve Jackson Games showed off some awesome new artwork for the upcoming Munchkin: The Guild booster pack. Len Peralta of Geek-A-Week fame is doing the art on this one and the buzz about this version is that it is going to be very, very good. Look for it in spring of next year. Next up is an expansion to the great and super-hot Munchkin Zombies game, called Munchkin Zombies 2: Armed & Dangerous. The pack includes 112 new cards, including a new power, Hungry, and a new mojo, the Patchwork Zombie. As always, the images and card rules are hilarious. Keeping with the zombies theme, there’s also the Munchkin Zombies Kill-O-Meter. This counter is intended to be used to track your combat strength, which is your level plus bonuses (and minus penalties). It also comes with a couple of bonus cards, Bowling League and Triskadekaphilia. As the proud owner of a Kill-O-Meter, you’re entitled to shuffle one of these cards into your starting hand. Bonus! Bad at counting? 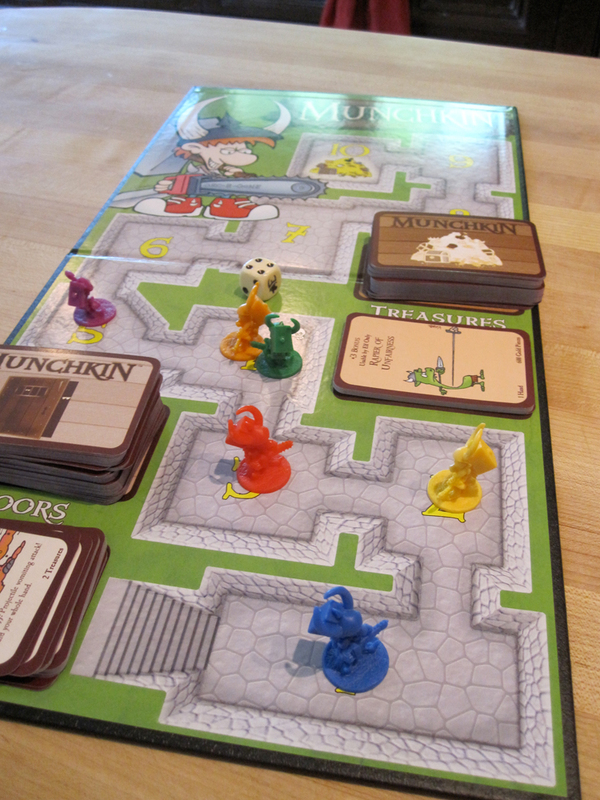 Be sure to pick up the +6 Bag of Munchkin Level Counters. This way, there will never be any guessing what level you’re on. The counters represent six Munchkin games: Munchkin, Munchkin Booty, Munchkin Bites, Star Munchkin, Munchkin Cthulhu and Munchkin Zombies. As a bonus, if you’re using the counter that matches the set (or one of the sets) you’re using, you start at level two. Hooray for unfair advantages! Finally, the game gets a super, fabulous makeover with Munchkin Deluxe. It’s still the game you know, with a couple of really cool additions. Not only do you get the same full-color cards you get if you just bought the basic Munchkin set, but you also get a Munchkin die, six really cool Munchkin pawns, a color card to go with each one and a gameboard to help keep track of levels (image after the jump). With all of these great add-ons and expansions, now’s a great time to jump in (or get back to) Munchkin. It’s a lot of fun! Disclaimer: GeekDad was sent a samples of these games.